Our range of products include point fixed glass connector and glass to glass connector for glass canopy. Reckoned in the industry as a manufacturer, importer, trader, exporter and supplier, we are busy in presenting Point Fixed Glass Connectors. These connectors are processed experts team, with their vast practice on their domain. 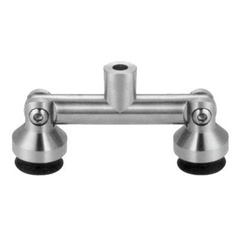 The provided glass connectors are widely praised by our customers for its attributes. In addition to this, clients can avail this glass connector from us in various stipulations. The Glass To Glass Connector for Glass Canopy is perfectly designed from finest material and latest technologies.